North of LA, surf quality takes a turn for the worse in the summertime. Long periods of 1′-2′ dribblers, punctuated by the occasional (some would say “rare”) south swell is pretty much the case. Finding an alternative ocean activity is a must. For me its kayak fishing. 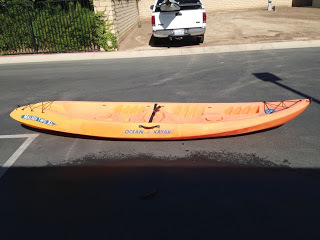 Through some trading and bartering I acquired this Malibu 2 XL tandem kayak. Turns out that the days when the surf is flat are ideal for kayaking. Most sit-on-top kayaks are built out of polypropylene plastic which is almost indestructible. Which helps when dragging it over rocks, across the beach or across a parking lot.